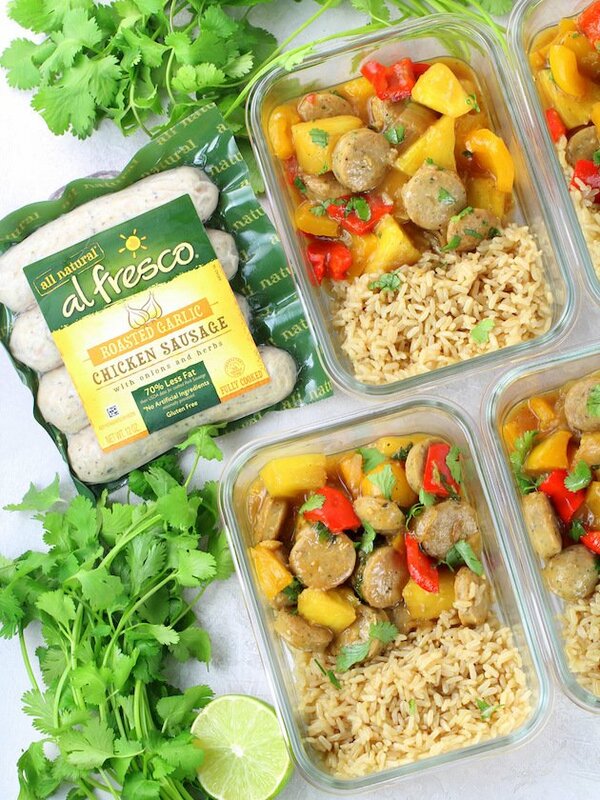 Thanks to our friends at al fresco all natural for sponsoring these Pineapple Chicken Meal Prep Bowls – they’re tangy and sweet and all kinds of delicious! 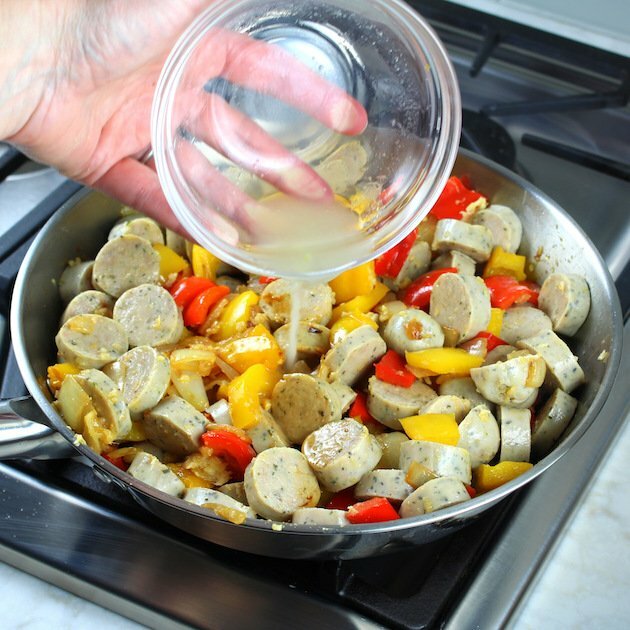 With brown rice and our favorite al fresco chicken sausage, these bowls are a quick, easy and well-balanced meal! Have you jumped on the meal prep trend? You know, basically a once or twice a week large batch preparation of meals to last for 4-5 days. This can be for breakfast, lunch, or dinner. 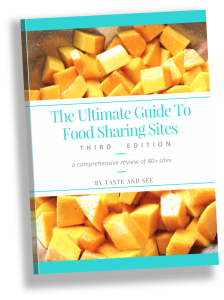 If you haven’t made the leap into meal prep mania you should give it some thought. It truly has some really nice benefits to offer. 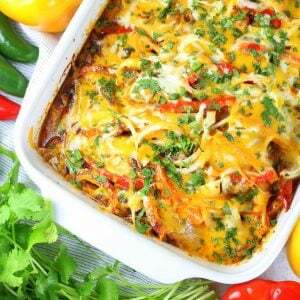 It can be a time saver since you’re batch cooking a few times a week instead of every day. In my book anything that saves you time is worth considering! It can be a great way to save you money: if you meal prep for the week you’re less likely to buy a meal at the café or grab some takeout on your way home from work. Meal prep is also a good way to eat healthier. 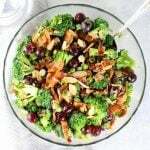 By choosing good-for-you ingredients and recipes, and measuring out your portions ahead of time, you can maintain a healthier eating plan. See like I said, it has some really great perks. What can I say… I’m always looking out for you my friend! 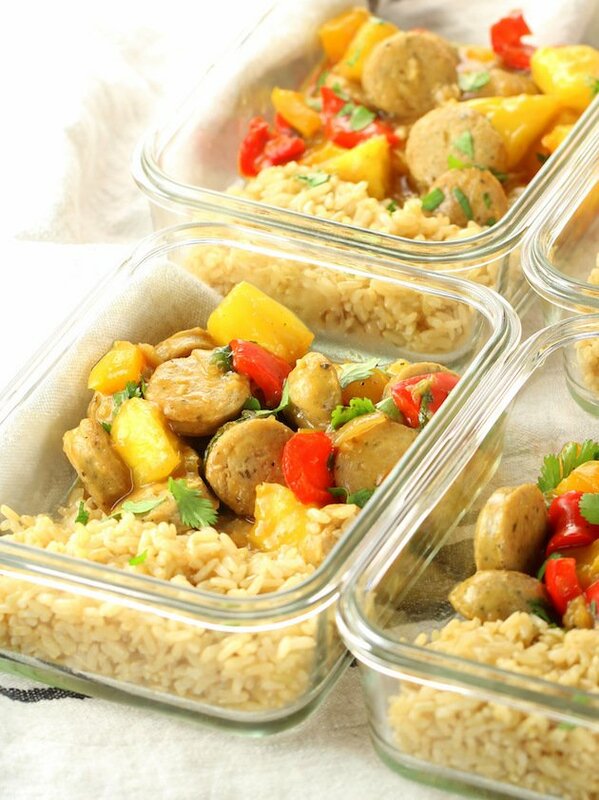 And speaking of healthy meal prep ideas with good-for-you ingredients… these Pineapple Chicken Meal Prep Bowls have it all and then some! 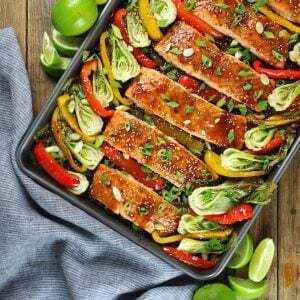 These are one of my favorite easy meal prep ideas! I’m a firm believer that healthy food can still taste delicious! Case in point, this amazingly tasty meal prep bowl! 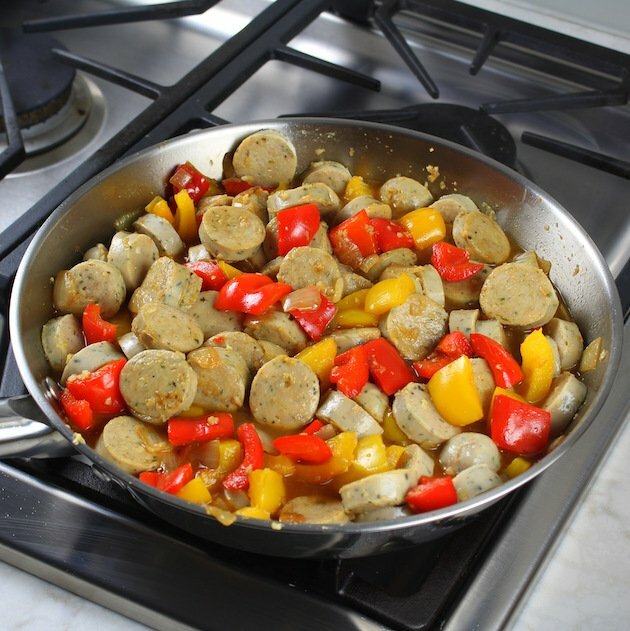 As you know I LOVE al fresco chicken sausage – literally the most delicious chicken sausage on the planet! 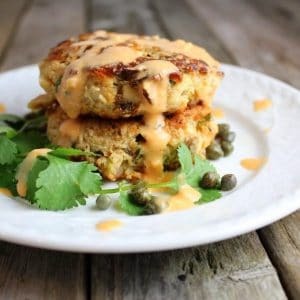 But of course that’s not the only reason my fridge is always stocked with this yumminess… It’s made with lean, skinless chicken meat, it’s gluten free AND the chicken is cooked and ready to devour in a matter of minutes!! Because there are always those nights when you didn’t put anything in the slow cooker and you just don’t have time to cook chicken breasts. 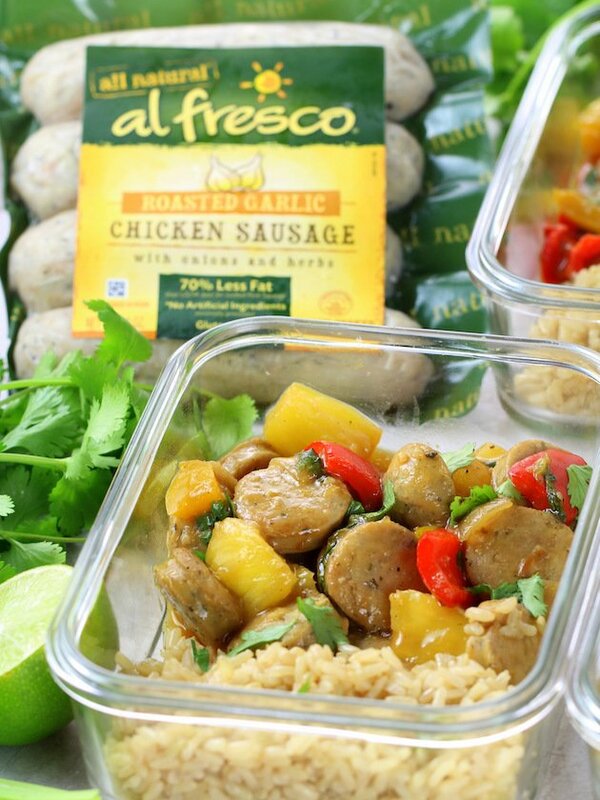 Yep – our friends at al fresco all natural nailed it with their chicken sausage!! 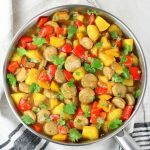 So you can see that their chicken sausage is the perfect protein choice for any meal prep situation, let alone these tangy and sweet meal prep masterpieces!! 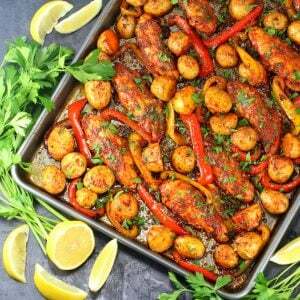 Since we’re batch cooking I used two packages of the al fresco garlic chicken sausage for this recipe and it made 8 healthy meal prep meals total. 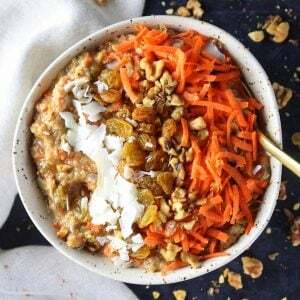 I also used brown rice for these bowls but you could swap that out for white rice, cauliflower rice, some leafy greens, or it turn it into a wrap. I just love options – don’t you? 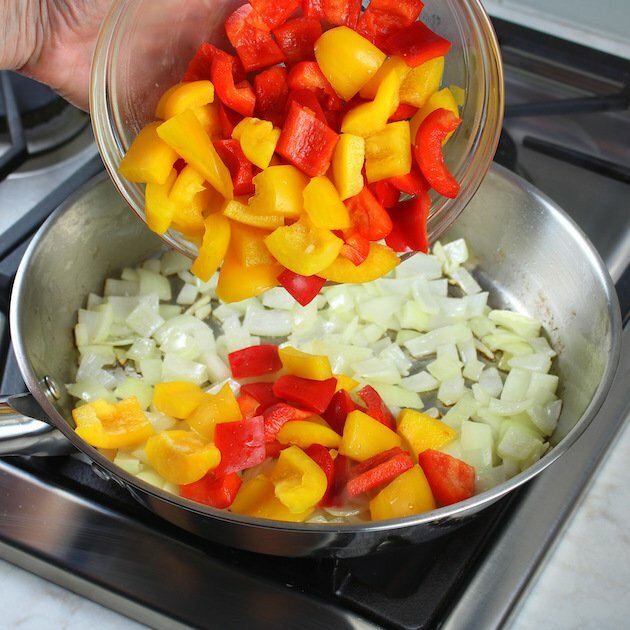 1 – Saute the veggies: Start by sautéing onion and peppers in a little olive oil on the stove top for about 5 minutes in a large skillet over medium high heat. Then add the fresh garlic and ginger and saute about one more minute. 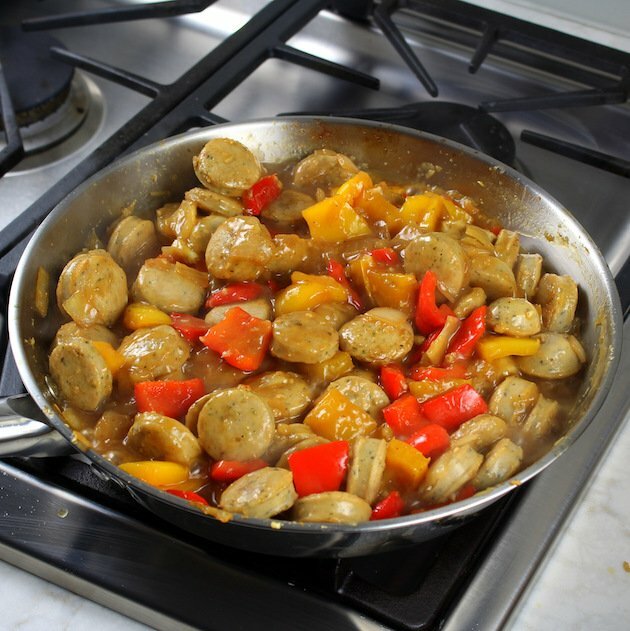 2 – Add chicken: Next, add in your chicken sausage and sauté for a few more minutes, stirring occasionally. 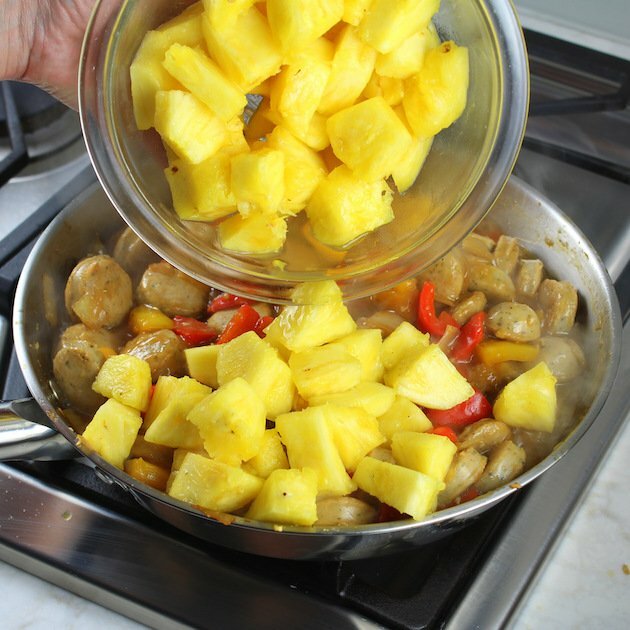 3 – Thicken up the sauce: Now add in your tamari (or soy sauce) and corn starch mixture, honey, lime juice and pineapple juice. Bring to a simmer and let it cook for a few more minutes until the sauce is thickens. 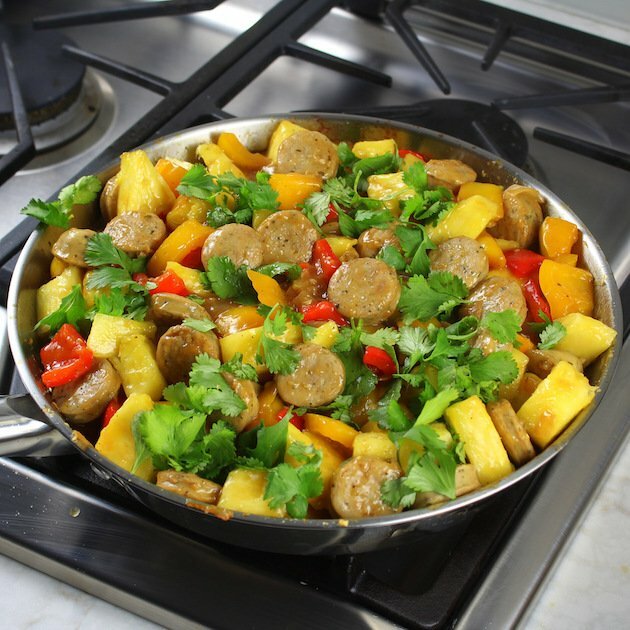 4 – Add herbs: Stir in the pineapple and the fresh cilantro and let the meal prepping begin! 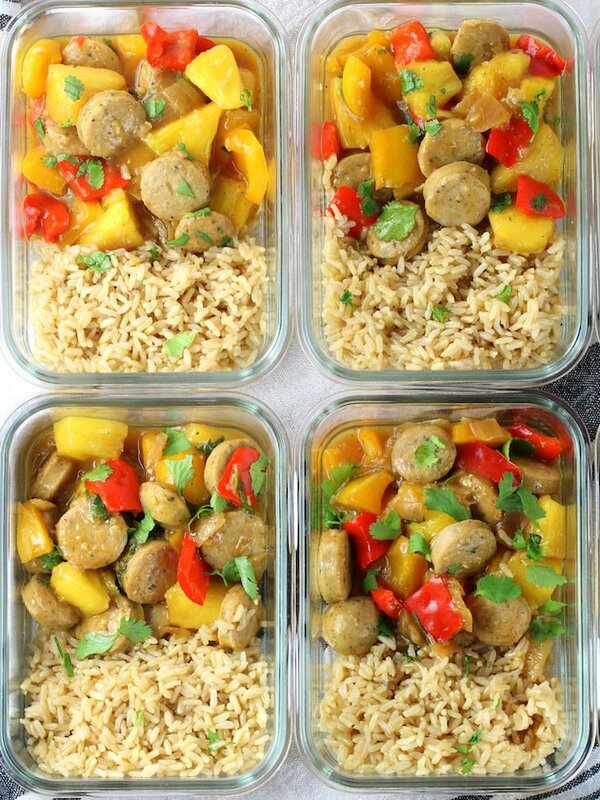 5 – Store & enjoy all week: I added a half cup of brown rice and a cup of the Pineapple Chicken to each meal prep container, sealed them up and voila… lunch for the week! These Pineapple Chicken Meal Prep Bowls remind me of a chicken stir fry, and make for some really easy meal prep! 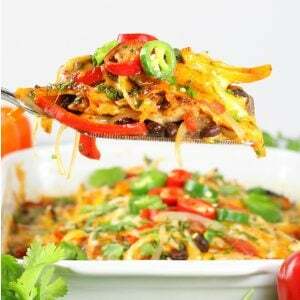 Plus, they’re a well-balanced and absolutely delicious meal the whole family will enjoy! These easy chicken Meal Prep Bowls are tangy and sweet and all kinds of delicious! 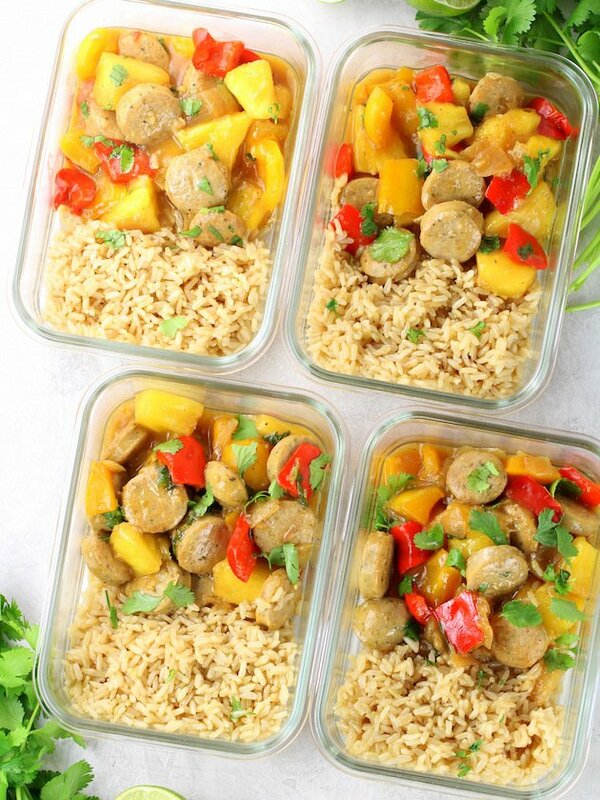 With brown rice and our favorite al fresco chicken sausage, these bowls are an easy and well-balanced meal in under 30 minutes! 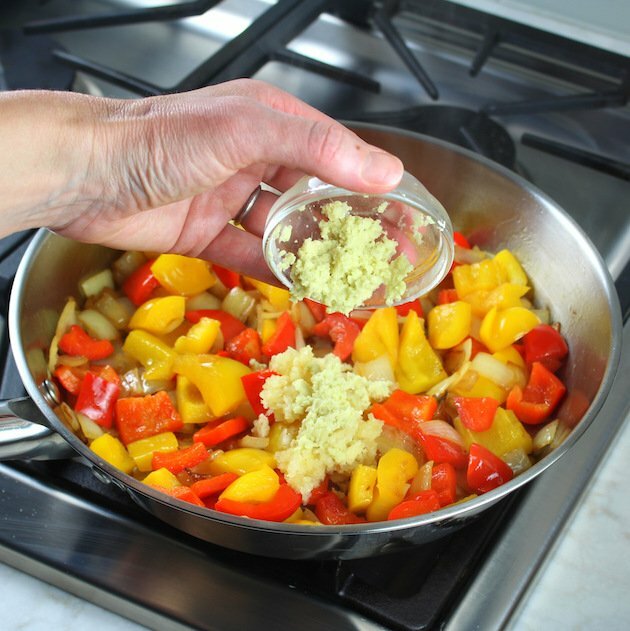 In a large skillet over medium high heat add oil, onions and sweet peppers and saute 5 minutes. Add garlic, ginger, and pepper and cook for 1 more minute. 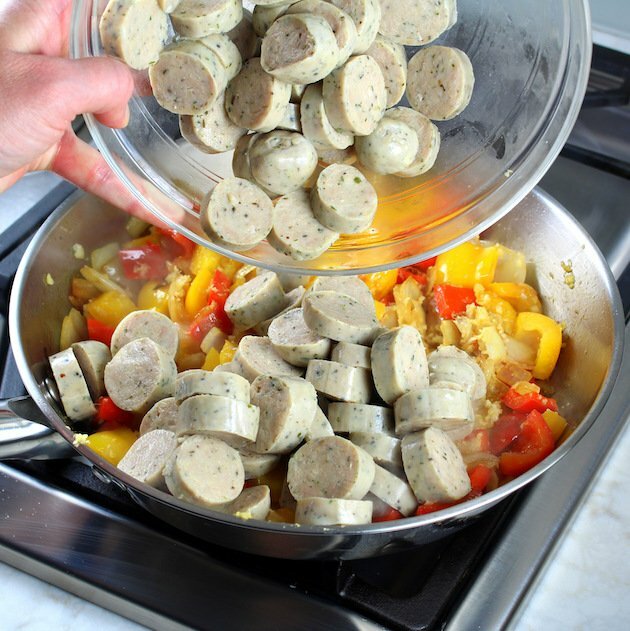 Add chicken sausage and continue to cook for 3 more minutes. 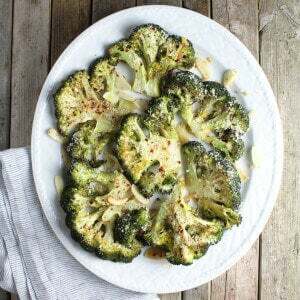 Mix the cornstarch and tamari/soy sauce in a small bowl and add it, the lime juice, pineapple juice and honey to the pan. Stir in and sauté for 2-3 minutes and allow the sauce to thicken to your liking. 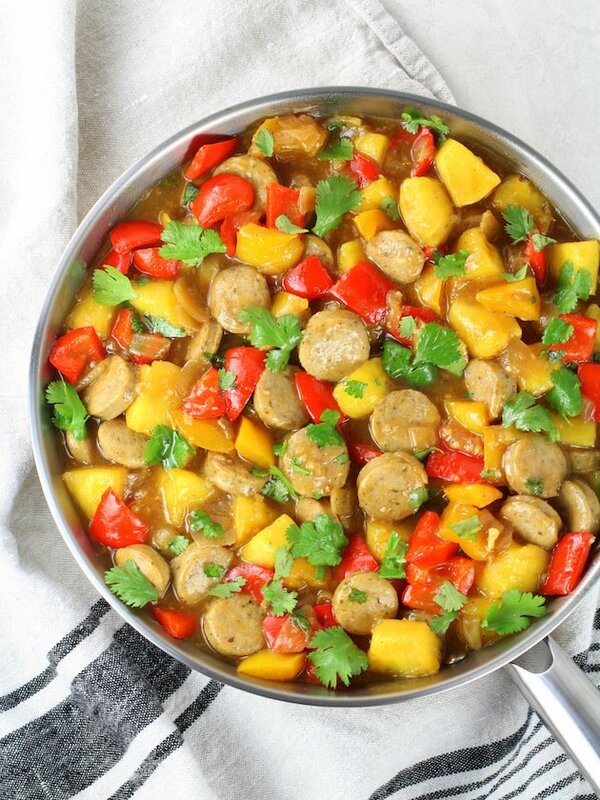 Fold in the pineapple chunks, cilantro and red pepper flakes (if using) and cook for another 2- minutes. Serve 1 cup pineapple chicken with 1/2 cup cooked brown rice, cauliflower rice, or white rice. Serving size is 1 cup of pineapple chicken and 1/2 cup cooked rice or cauliflower rice. You can also garnish with green onions if desired!